Training Morgan and AMERICAN Saddlebred Horses since 1983. At their Hugo, Minnesota location since 1997, Hardwood Creek Farm offers a full-service training, showing, and lesson operation specializing in Morgan and American Saddlebred horses. Amenities include a heated barn with over 50 stalls, a spacious indoor arena, two tack rooms, and an observation window. Lyle and Colleen Wick, owners and trainers, have built a national reputation through their commitment to an ethical, safe, family-oriented environment that ensures safety and proper training of both horse and rider. Their exceptional qualifications and expertise have resulted in years of ribbons and awards at regional and national shows where their entries have won numerous world championships in different disciplines. 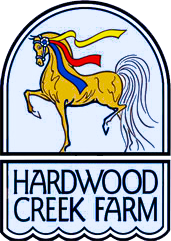 Hardwood Creek Farm offers services that cater to riders of all levels and styles. From first rides to first place victory passes, they thrive in bringing the joy of horses to people of all ages and levels. Please contact them to inquire about equine training, lesson, and show services.